Why you should incorporate kettle bells into your life. Face it, you are an athlete, and that means a tight schedule to get your workouts in everyday. The kettle bell builds on the essential muscles needed for all areas of triathlon while being a fast, easy workout that you can do inside your own home. Kettle bells are key in working out your core, flexibility, and cardiovascular system. Kettle bells help build lean muscle while providing a quick and easy strength workout into your busy schedule. Since kettle bells work out your core and flexibility, this means that they are an essential tool to preventing injuries. Think about it, if you have better core strength and flexibility, that means you also have better posture on your bike and balance on your run, preventing you from falling over and improving your speed. Please Note: Focus on proper form. Do not skip proper form because you will injure yourself. Stand with feet shoulder width apart and have the kettle bell in-between your legs. Grab the kettle bell while bending your knees. Don’t worry if the kettle bell swings in-between your legs. While snapping your hips forward, raise the kettle bell to chest level with your arms straight. 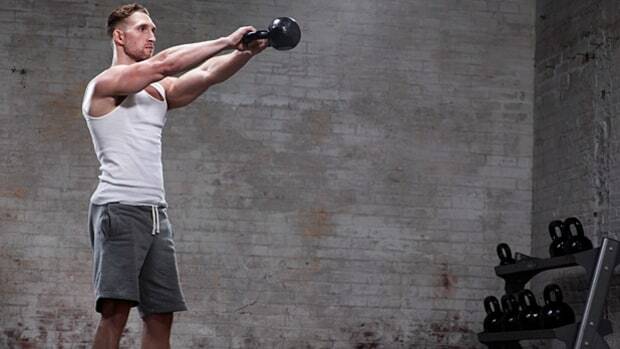 Swing the kettle bell down in-between your legs and up to your chest for one minute. Start ready to do a lunge with the kettle bell in your right hand. When you lunge, switch the kettle bell into your left hand, passing the bell underneath your legs. Stand back up and repeat. Start in a standing position with your knees spread a bit farther than shoulder length apart. You should be in a comfortable standing position. The kettle bell should be positioned next to one ankle. With both hands, pick up the kettle bell. Lift the kettle bell with both hands, not using the handle, up to the opposite shoulder. For example, if you start with the kettle bell at your right foot, you would lift cross your body to your left shoulder. After you lift up across your body, slowly lower the weight back to the starting area and repeat. Do this exercise on both sides of the body for an even workout. This exercise works your core and endurance. Start in the same position as the wood chop, but holding the kettle bell in your right arm, which should be raised above your head. Make sure you have a good grip on the kettle bell handle so it doesn’t come crashing down on your head. The goal is to have your left hand touch your toes. Slowly go down making sure your body is straight. Turn your left foot about 45 degrees as your left hand aims to touch your toes. Your body should look only bent at the hip and your chest should stay facing outwards. The kettle bell will be directly above your head and will make a straight vertical line with the left hand. Slowly rise back up and switch sides to even out your workout. Besides being a Janis Joplin song, it’s also a great kettle bell workout. Start feet shoulder width apart and go into a squat position with the kettle bell in both of your hands. While you are squatting, have the kettle bell on the outside of your left leg. When you are standing back up raise the kettle bell with both hands in a giant half circle over your head towards your right leg. When the kettle bell reaches your zenith, or just above your head, squat again and move the kettle bell to the right leg. It should be an up down squat motion with the kettle bell looking like you are trying to show it off above your head in a game show. These simple and quick kettle bell exercises will strengthen your core, which helps your posture. It helps your range of motion especially in the hip area, which will benefit you on your runs and it helps get your blood pumping efficiently throughout the rest of your body, which means better circulation. Kettle bells are a win-win situation as long as you have proper form. Consider a kettle bell the next time you want a whole body workout without spending hours trying to get one. Plus, you can easily store a kettle bell as a doorstopper. Ding Dong, Happy Kettle Bell Training! 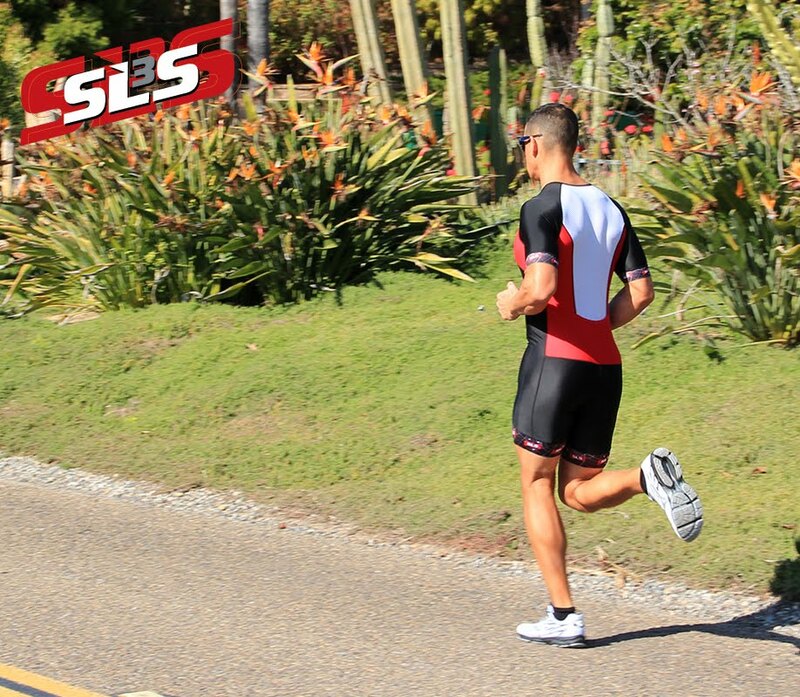 Training endless for triathlons can be such a bore, that’s why it is important to spice up your workout routine. CrossFit is a great way to change up your boring routine, while adding some extra benefits that will help you improve your triathlon. CrossFit helps triathletes by finding their weakest link in training and helping to correct it, so that you can improve that section of the race. It’s safe to say you will probably endure some push-ups and planks in the CrossFit setting. What your elbows do in this setting can tell a lot about how your body is doing. If your body isn’t stable and your elbows become wobbly, it’s a sign that your core may need some more focus. If your squat form needs work, it’s probably a sign that your hips need work also. Targeting your weak areas in CrossFit can help you focus your training to your specific needs, which will give you a faster time. Training with the same routine makes you only mediocre in that area. Adding different workouts will improve the muscles that get ignored in your normal routine. CrossFit is beneficial, because it aims to workout all your muscles in one workout. Incorporating flexibility, jumping, and lifting into your routine, CrossFit helps you strengthen your muscles with high intensity workouts, which translates to you having quicker times with more energy. CrossFit is an indoor workout that remains intense, which gives you results. In the off-season this can be crucial when the temperatures and conditions outside prevent you from keeping up your pace. 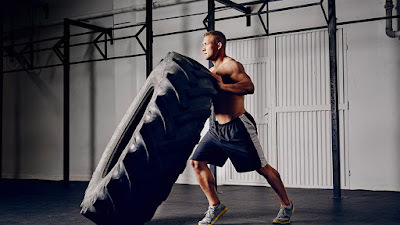 CrossFit workouts improve your strength while still maintaining aerobic workouts. This means that your heart won’t lose its strength, while your muscles are building strength, which is hard to achieve during the off-season. CrossFit requires you to do as many reps as possible while the time is ticking down. In your head you have to count your reps all while striving to complete your goal in a matter of seconds. The workout isn’t just pushing your body to its limits, but it’s pushing your brain to it’s limits. Multitasking while maintaining high intensity focus gives your brain a bit of a workout. Why is that important? It’s important because on the last leg of the run portion when your mind is giving out and adapting a defeatist attitude, you’ll be trained to overcome the mental blockade from training in time constraints. Often times training for triathlon type events are done in solitude, but is it always best to be alone? Working out and training with people around you provides benefits. Firstly, training around people gives a little sense of competition. You can compete with the person next to you over a small set. This pushes your drive through the roof and can give you a better more intense workout by putting your brain in the competitive mood. Secondly, people support each other’s goals in group settings. CrossFit is an area where everyone is there to workout and everyone wants to achieve a fit lifestyle, regardless of competing in triathlons or trying to stay in shape. The most important benefit of the community aspect is the help and critique you receive. People can see what your form looks like and can help you correct it; conversely, you can help correct other peoples form and make new friends. CrossFit has a prejudice that it creates many injuries. When doing CrossFit, make sure that while you are pushing yourself, you are maintaining proper form. If you have to go slow to maintain proper form, by all means go slow, you will still achieve a beneficial workout by going slow and reduce the risk of injury. Don’t push yourself too hard. You may be looking over at your friend who is in beast mode and you want to compete with them, but remember your goals and don’t push yourself too hard. Being stuck on the couch recovering because of over-training is not something you want to do. Find an amazing coach and you will benefit from CrossFit. A great coach can help you by teaching you body mechanics and therefore improve your form in all sports. You might be thinking “Standing still and stretching on the floor, how will that help me with triathlon?”. Hear me out. Firstly, it’s the holidays and we should all take a little bit of a break and take a breather to relax. Secondly, it’s a great stress reliever and after shopping for gifts and looking at my budget, I could use a stress reliever. I’m betting you could, too. The mountain pose is an easy way to start and helps with breathing and the arches of your feet. Stand with your legs together, arms together, and palms facing out in front of you. Focus on keeping your back straight, your core tight and breathing with a measured, relaxed pace. Gently lift only your toes up. Then place your toes back on the ground but keep the stretch in the arches of your feet. Remember to keep equal weight on all parts of your feet to prevent injuries. You will feel this in the arches of your feet. This one is my favorite and a variation of this stretch can be made into an exercise. For the bridge pose, lie down on your back with your feet together and your arms together. Slowly drag your legs so that your feet are flat on the ground, shoulder width apart. Your legs should be halfway between your body and where they were when they were extended. Gently push off the ground, exhaling your breath. Your head, shoulders, and bottoms of your feet should be the only thing touching the ground. Move your arms underneath your body and hold your hands together. Hold this pose to stretch your hip flexors and abdominals, while strengthening your glutes and hamstrings. The pigeon is often incorporated into stretches for dance, because of its ability to stretch the outer thigh. Start out with your right foot tucked so it is touching your left hipbone area. Your left leg should be extended behind you with the knee straight down touching the floor. Be careful not to rotate your hips and not to place your right knee pointing in the center. Your hips should be straight and parallel to each other, not leaning either way. Lean forward until you can feel the stretch, but you are still comfortable. If you are flexible your chest can touch the ground, that may take some time though, so don’t be worried if your arms are the only part of your upper body touching the ground. Switch legs to stretch both sides. The following poses are in my opinion the most fun of all yoga classes. They stretch you out and relax you at the same time. Who said workouts had to be boring anyway? When my sister and I first started doing yoga together I looked at her with confusion when she was ecstatic that the instructor told us to get in the happy baby pose. It’s a weird name and there was no way a happy baby could produce this good of a stretch. Start by lying down on your back. Then, as a baby would, grab your outer right foot with your right hand and your outer left foot with your left hand. If you are doing this stretch properly your core should be exposed and you will probably feel a little bit like a frog, I know I do. Then rock side to side, back and forth. While you are rocking, pull your legs down to the mat or floor to deepen the stretch. Careful not to go to fast, this is a slow stretch and will help your hips and legs. Now that we’ve grown up from the happy baby, we can work on the child’s pose. Start sitting on your legs, with your shins on the ground so that your gluteus maximus is sitting on the bottoms of your feet. Imagine you are a karate master for this sitting position. Then take your arms shoulder with apart and stretch forward with your arms. Your lower body should remain in the sitting position. You should feel the stretch in your upper legs, lower back and shoulders. Keep your head down and focus on your breathing. This stretch is a great way to relax. Stay in this position for as long as you want. Gruesome by name, but literally the best pose after any hard workout, the corpse pose should be incorporated into any post workout or hard day. Lie down on the ground with your feet shoulder width apart, they should not be touching. Spread your arms so they are not close to your body but relaxed with palms facing toward the sky. That’s it. Just lie there and focus on breathing. Slow your breathing down so it is evenly paced, I like to breathe in on five counts and breathe out on five counts. This will slow down your heart rate and relax your mind and body. The corpse pose is amazing at focusing your mind and relieving stress. Stay in this pose for as long as you feel like, or until you wake up. Yoga is a great way to stay active, while relaxing. During the holiday season, take a day or two to practice the stretches and add new ones that you like to strengthen your body and mind. Relax, Breathe, and Happy Holidays!